Welcome to Show and Tell Friday! Last weekend was the 3 week anniversary of being in my new apartment. I'm still trying to get everything to fit but it's slowly coming together. I have all the extra stuff that I can't find room for piled in a corner in my bedroom. There isn't enough room in my dining room for my china cabinet so I have it in the corner of my living room. The bad thing is, my air conditioner is directly behind that so I'm not sure how well that's going to work in the summer. I'll deal with that when the time comes! The very top thing on my to-do list is to repaint my coffee table! It's just shabby at this point...there is nothing chic about it! It's the first piece of furniture I ever painted. I think my daughter was 6 or 7 and now she's 21 so it's time to repaint! As you can see in the top photo, my kitchen is very open to the living room and I'm loving that! The whole place is very open actually. There aren't any hallways, the bedrooms are directly off of the living room...it's very cozy. Even the patio is very open...it's right on the walkway to the pool, the gym, the tennis courts, the basketball court and the leasing office so there is a constant stream of people walking by. That is taking some getting used to. I'm a person that loves the blinds open but I sort of feel like I'm living in a terrarium with people walking by and looking in. I guess there a pluses and minuses with every place! I have a funny story about these flowers. My daughter told me last week that the farmer's market in downtown Campbell had beautiful bouquets of gardenias for sale and everyone was walking around with them and they smelled so good. She works in downtown Campbell and had to go in early on Sunday morning so she said she was going to buy some gardenias this week. She came home with these. Ummm...those aren't gardenias! They are double paperwhites and although I love paperwhites they don't smell nearly as good as gardenias. They are beautiful but I find the scent of paperwhites a little very overwhelming. They are gorgeous though and I love that she brought me a bouquet! I guess my eyes override my sense of smell because I'm loving them even though I think they stink! I honestly think the double ones smell double strong! It's just too bad they don't smell like gardenias! Thank you so much for hosting. When I was a little girl I would go out and collect wild flowers and bring them in to my mother and she would thank me and put them in a vase. You would of thought I had given her a great gift. Many years later I figured out that she was highly allergic to them - but she thanked me like I had given her the world. That is what a mom does. Your living room looks beautiful! Can't wait to see more. I have complained for years about the smell of paperwhites. Kind of a "medicine" smell but I might forget it for the doubles. They are beautiful! And LOVE your cloches on the counter top ! Cindy, they are pretty blooms, but I find paper whites to be overpowering as well. 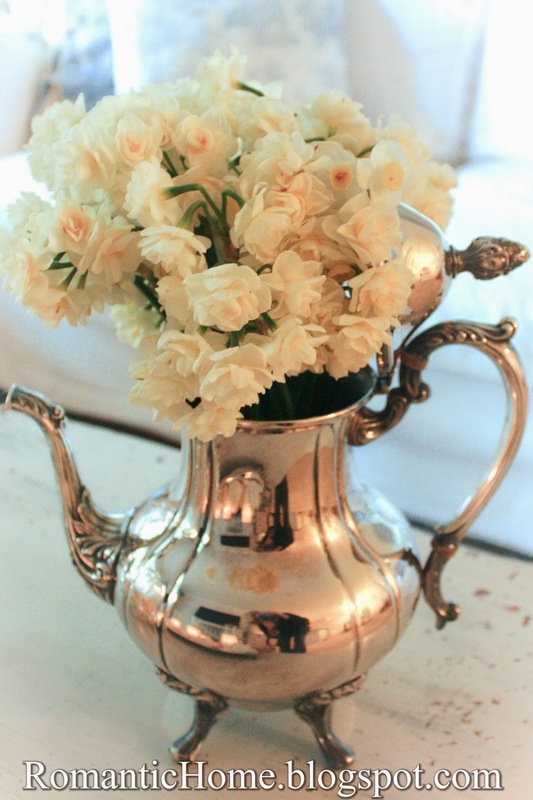 Love the fragrance of gardenias though. Your new apartment looks cozy and comfortable. thanks for hosting. enjoy your new space. You have made your new home so inviting and lovely! Oops I am sorry Cindy I realised after I linked up that it was meant to be something from my home, it is a house tour but it is beautiful. I have another link with my bedroom I will link up. I love your new place, your furnishing is gorgeous and looks very French. I have just been through a house today, it was amazing, I am hoping to be able to photograph it for my blog. It is Italian style and the owner is an interior designer, it is the most incredible house and I just wish I could have moved in there. I love your table, its not shabby at all and its easy to paint again anyway. I like it as it is. Would love to see more of your apartment. Your new apartment looks lovely - already!! Yes, it looks very cozy, indeed. I can't believe your coffee table is getting a new coat of paint; I was admiring it before I read that you were going to redo it! 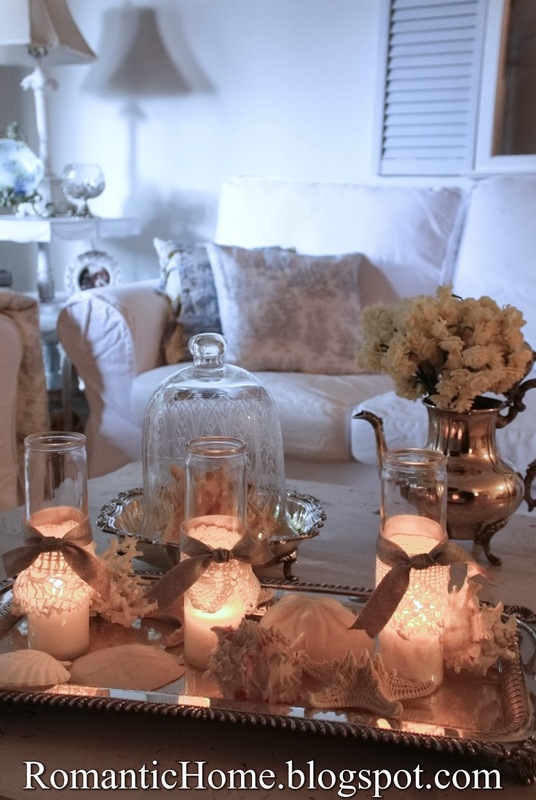 Beautiful, you put your home together fast after a move impressive! Thanks for the party! Your living-room is really coming together nicely! Your place is looking just lovely! I am the same way about having my blinds open with a lot of people going by! That's so funny about the "gardenias". hehehe Thank you for hosting! Cindy,you have your space so nice. It's a shame that there are some negatives,but I'm sure you will grow to love it with all the plus's. I love your taste in decor. Your living room looks beautiful. Love how you decorated the balcony. It is difficult to go down in size but you did it great. 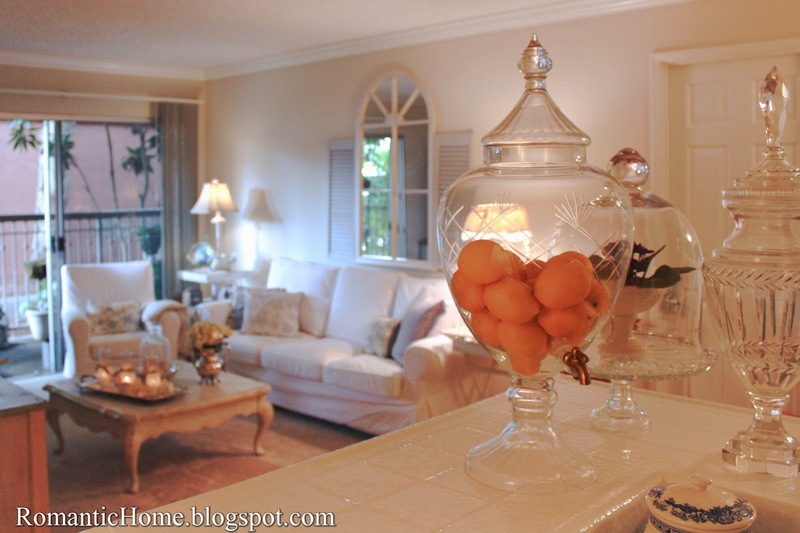 I like how you put the china cabinet in the living room. Enjoy your home. Your apartment looks beautiful! Thanks for hosting such a great party! I am really really happy for you! Your apartment is lovely. You have been so busy but you have done a fabulous job, you should be proud! It's looking extremely cosy and cute. Anyway, looks lovely and can't wait to see more! 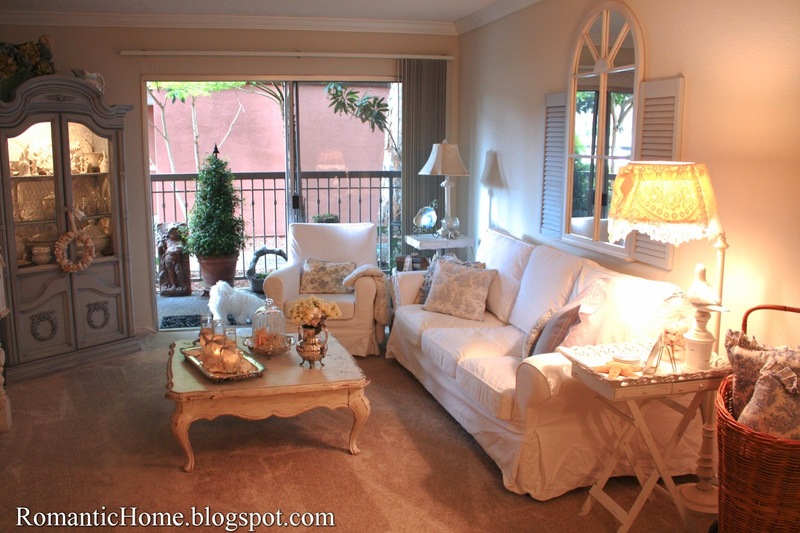 Your living room looks lovely and homey already! Beautiful! Thanks for hosting! Your place is really coming together nicely. Love what you have done in such a short amount of time. Your living room is beautiful. Happy New Home! Hi, Cindy! I love your new apartment!! It looks Beautiful. Yay for you!! Thanks so much for letting come join in on your Party! Always love visiting your Beautiful spot here!! Many Blessings in your new place! Your apt is lovely! The first I was given Paper Whites it took me awhile to realize the flowers were where the order was coming from. It was pretty funny when it happened. Thank you for hosting and have a wonderful day! stunning. It is not easy to downsize but you have mastered it. I look forward to your blog. Betty from Ontario Canada - where it is warmer here today just 0 today instead of -22. Pretty flowers but agree on the smell. Hyacinths is another flower that does not smell all that good. Started to buy a pot of them not long ago but could not get past the smell. You are crating a very pretty home in your new place. your apartment looks beautiful! I also think your table looks great just the way it is! You have done a lot in three weeks. And so sweet of your daughter to bring you flowers. thanks for hosting! It is so fun to see you decorating again..a new place. Looks great! What does your dog think of all the people walking by? That apartment of yours is looking sooo beautiful! The AC thing will just bring out your creative genius, but I love the cabinet now. I don't think I know the scent of pepper whites, but I'm that way about hyacinths. My friend always brings me one to "celebrate" spring. I love the look, but that scent overtakes the whole house. Dindy..you know I've been following your blog for several years now and never grow tired of looking at it. The candles you have on your coffee table..are they real candles or the ones that take batteries? Can you comment on what you have done to the outside of the glass/vase they sit in? Your new home is looking pretty! Congrats. Looking really good for the time you've been in your new place. I also hate hate the smeall of paperwhites! It's too bad that your cabinet is in front of the AC as it looks fantastic there. How I loved it when folks treated there apartments homes with care and made them beautiful. It was such a joy to live close to people who cared. It was also great having all those extra amenities. HUGE pool, tennis courts etc. I am back in a private single home once again..but I remember my apartment days fondly! It's nice meeting you, Cindy.